Powered by 4-cylinder engines with optional turbocharging, the Chevrolet Malibu features a handsome and modern exterior, a spacious and comfortable interior, a smooth ride and well-controlled handling. 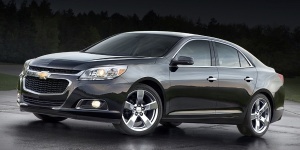 For 2015, the Chevy Malibu benefits from an updated OnStar version with 4G LTE and standard built-in Wi-Fi hotspot. Find the used Chevrolet Malibu of your choice from a dealer in your area. Search our used car listings now.